In 1999, Deborah (Debbi) and Robert (Bob) Rodak purchased the Cross House. It had been boarded up. This was the low point of the house, and it was dangerously close to being condemned and demolished. The Cross House, 1999. More images at the end of this post. When we found out the Cross House was for sale we knew we would buy it. It was just a matter of how much would we would have to pay and what was the condition? We looked beyond the boarded-up windows, the termite-eaten floors, the rotted siding, and the plumbing which leaked in hundreds of places. We saw the house’s potential for Emporia and took on the project because of our hearts (ignoring our heads). First and foremost, we wanted to do no harm. We planned on restoring the house, as close as reasonably possible, to the original blueprints. We thought that nothing in the house should be destroyed or changed in a way that it could not be reversed. All work was to be performed without compromise and be as perfect as possible. Second, we wanted to modernize the mechanical systems in the house so that it would be safe and economical to maintain. We dreamed of taking 21st-century technology and hiding it in a 19th-century home. When we purchased the house it was kind of eerie. It was like somebody just walked away and boarded up the windows. There were dishes in the sink, clothes in the closets, and bills on the dining room table. We started the project by uncovering all the windows (the ones not broken!). This gave the house a whole new feeling. We called the city and asked them to turn on the water. As we had feared, the pipes had frozen and burst, and water came through the ceilings everywhere! (The good thing about this was the hundreds of roaches we found were all dead!) Topping this off, most of the toilets in the sixteen full baths had frozen and the porcelain had cracked. Even the main sewer line was plugged and the four-inch cast-iron drain pipes had cracked, pouring all the sewage water onto the basement floor! Despite all of this, we cleaned up all the rooms and held a free open house on May 1 & 2, 1999 [Ross: This is when I first visited the house]. We felt it important to let Emporia view this grand home before restoration because it belonged to everyone’s heritage and had been held privately for so long and closed to the public. A brief mention in the Emporia Gazette on March 31st, 1999, announcing the open house, brought nine hundred people to view the house. Living in the house was akin to camping. After capping off most of the water lines, replacing about forty-feet feet of the main sewer line, and replacing the ancient hot water heater, we managed to get one of the sixteen bathrooms working. Initially, we hauled water for cooking, cooked our meals on a BBQ grill, and washed the dishes in the bathtub. The lighting and electric in the house was sparse because we initially had circuits that would not work or would sizzle when you turned them on. The phone line was sporadic. When it would rain, the line was so full of static that you could not place a call. If someone would call during these times, the phone would ring once and no one would be there. One time, in the middle of the night, we were woken up by the police in the house because the phone lines called 911 and they couldn’t call us back to confirm it wasn’t an actual emergency! A lot of people would never have put up with this. Things like this break up marriages. Through all of this hardship, Debbi never complained. The house was a mutual dream. We both had a conviction to the house which never wavered. These shared experiences brought us closer together. During the first year we replaced the four-inch drain line, replaced the hot water heater, repaired the sizzling electrical circuits, and replaced the ancient boiler with four high-efficiency pulse boilers. This was our first experience with an unethical contractor. We purchased our own boilers. We had an estimate from a company for $13,000 which we felt that we couldn’t afford. One company we contacted said that the estimate was outrageous and that they could do it for much less than their $12,000 quote if we allowed them to work on a time/materials basis. We agreed. They came back with a finial bill for over $18,000! The big problem was that they ate up almost all of our equity line and we had little money left to further our project. This left us doing projects paycheck to paycheck. We concentrated on demolishing some of the add-on bathrooms from when the house was a motel, and stripping the paint on the outside which was badly peeling and nearly 1/4″ thick in some places. On June 14, 2000, the painting contractor was stripping paint on the outside of the house with a heat gun and ignited some birds nests behind the tin scrollwork in the eves of the third floor [Ross: I have made it an inviolate rule that no heat guns can be used on the Cross House]. Fortunately they realized their mistake immediately and called the fire department. Unfortunately, the contractor had no liability insurance and immediately moved out of town after the fire. Our insurance company paid but because of the condition of the house we have never been able to adequately insure the property. Because of this, we were able to make the basic repairs to close the house’s envelope but we still have a couple rooms gutted from the water damage. When the firemen were at the house and we watched them fight the fire, we noticed that the west side of the southwest chimney was caved in. This unstable chimney, nearly twenty-feet high, towering over the house REALLY worried us. We feared that one day it would topple over into the bedroom which we were sleeping in. We had several masonry contractors come to look at the problem, and hired one. The quality of his workmanship was not up to the standards we expected on the house but at least the chimney was stabilized. The contractor told us that one of our other chimneys was in poor shape and in danger of collapsing, too. Because we were already worried and were unable to find any other masons in the near foreseeable future, we agreed to let him do that chimney. He said he needed money for materials before he could start. We paid him nearly all the money to complete the second chimney but he never came back. We hired an attorney and received a judgment but were never able to collect a single cent. Eventually, we found another contractor to repoint the second chimney. The last part of the nightmare was discovered by accident. We were doing foster care for a young girl. The state of Kansas requires that all children with a medical card receive a blood lead level test at their first birthday. We found out that Ashley’s lead levels were elevated beyond safe levels. We had our other children checked and our other daughter, who is younger, also had elevated lead levels. Our son, eleven at the time, tested normal as did Debbi and I. The disturbing thing is that lead poisoning awareness is targeted at the lower income persons and middle class America is falling through the cracks. If not for foster care, we would still be poisoning our children! 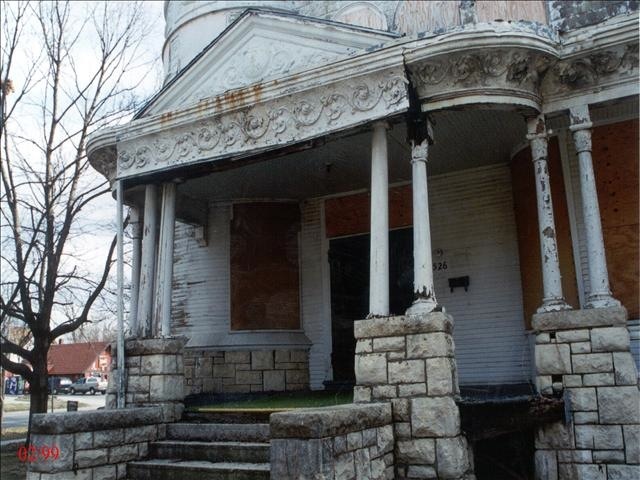 We had the house thoroughly examined by Kansas Childhood Lead Poisoning Prevention and determined that the problem was caused by stripping the exterior paint. We had heard of lead poisoning from lead water pipes but we had never heard of dust causing lead poisoning. We started collecting any paint residue via a vacuum connected to power tools, cleaned the lead paint chips up from outside the house, put barrier glass over all the windows, installed a central vac unit to avoid recirculating the lead dust, never wore our outside shoes into the house, and had a housekeeper come in twice a week to mop the floors and dust all the furniture. Despite all our efforts, we were unable to make our children’s lead levels come down to normal levels. In 2002, we had no choice, for the sake of our children, but to move out of the house. We initially moved into 527 Exchange [Ross: this home is directly to the east of the Cross House] and have now moved into the “Companion House” to the Cross House at 524 Union [Ross: 524 has since been confirmed as the original carriage house to the Cross House]. We anticipate living there for about five more years until we can remove all the lead paint and move back into the “Big House”. On a positive note, our family and the Cross House were featured in large article in the January 2004 issue of Parents Magazine on lead poisoning prevention. We were very happy about this article because it brings the message to the middle class. Throughout the years of our ownership, additional things have been accomplished. When signed a purchase contract on the house we shored up the roof on the front porch even before we closed because we felt that it was in danger of collapsing any day. We also had to have the termites treated. They were so bad that they had eaten clear up to though the oak flooring on the first floor which we eventually had to replace. The exterminator said that the termites have been freely feeding on the house for over twenty years. On the outside we have repointed the stone foundation, replaced the hazardous electrical service panel with a new breaker box, have nearly stripped off all the exterior paint, and have repaired and repainted some of the areas, including all the third-floor dormers. On the front porch, we have removed the rotting posts and put in temporary timbers. We raised the sagging roof over the front steps about six inches, and removed layer and layers of shingles from the front porch roof, re-decked it, re-shingled it, and replaced the rusted-out built-in gutters with new metal. Most of the front porch has been repaired, painted, and completely rewired. On the north porch, we have rebuilt the crumbling stone steps. On the main roof, we have repointed the east chimney (with a different contractor), replaced missing shingles, and have lined about one third of the remaining built-in guttering system. Inside, we have removed eight of the initial sixteen full bathrooms (the house was built with three). We have re-plumbed two of the bathrooms and the third floor kitchen, including drains and supply lines. A dishwasher has been installed in the main kitchen (in a temporary fashion) and new gas lines have been run for the stove. New electric, water and drain lines have been run to create a laundry room. We have filled some of the outside walls with rigid foam insulation to try to eliminate the financially crippling gas bills that have run as high as $1500 for one month. The whole third floor, 80% of the second floor and about 20% of the first floor has been rewired. The old phone lines have been cut and new lines run to various rooms. All wiring is hidden inside walls and not strung on the outside of the house or along the baseboards as was previous. Various rooms have been wired with coax and Cat 5 for computer terminals. A whole house automation panel has been installed which automatically controls lighting and electrical outlets via computer control. Central air conditioning has been installed with electrical dampers to try to create affordable cooling, although the dampers are not yet wired to a control unit. We have installed a video camera security system to keep the house safe while we are not living in it. I’m sure there is more that slips my mind right now but I will update this page as I recall additional accomplishments. All of the above would probably be enough to make most people walk away from this project. Throughout it all, we have never wavered and are as determined, as we ever were, to make this house the grand old dame that she once was! We’ve received some support from a few generous people but need a lot more help to turn our personal nightmare into the dream that we know it can be for all of Emporia! The above was written by Bob about ten years ago. After moving next door into the carriage house, the family never did move back into the Cross House, although work continued. Debbi passed away in 2012. Bob put the Cross House up for sale shortly thereafter. I purchased the house, and the adjacent carriage house, in 2014, and am deeply grateful to Bob and Debbi for their commitment to these historic properties. 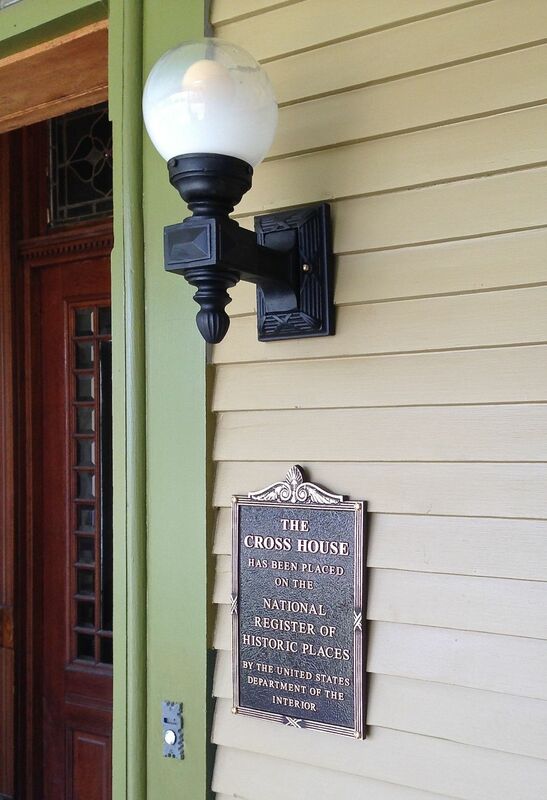 Bob has a permanent VIP pass to the Cross House, and it was through his efforts that the Cross House was listed on the National Register of Historic Places. What a labor of love, sweat, $$$$$$, and commitment! Keep on! I remember this house well when it looked like that. I loved that house since I was little and always wished somebody would restore it. I worked in the carriage house briefly when it was owned by Bernita Thompson. Stephanie Thomas and I operated a wellness center there. Loved the house, but even though it hadn’t been so badly neglected as the main house, it needed a lot of work. The other day I drove by and could have sworn I saw you in the yard . . . then I saw Joy and she told me you owned it! Ha! So glad for you and the house. Rachel!!!! Please come by again; I will give you the Grand Tour! Only 25 cents! The picture above is my favorite picture of this house. You can almost hear in screaming in pain for someone to come and get it and take care of it!!!! LOVE it! Hi Ross! It’s Karenz from OHD and I just found this blog. I have been reading the story of your house and actually cried when I read that Debbi passed away. I was worried that something like that happened 🙁 I’m glad that you and your wife are tackling the restoration and it’s amazing how much can be accomplished when it is a labor of love. It was very sad when Debbi passed away. Quite shocking. Ah, and I am not married! Just me working on the house, and with a lot of help! Oh, I’m so sorry! I thought that someone said that they saw Joy in the yard and that’s probably where I went wrong, lol! I’ve got to read so much more that it’s going to take me DAYS! Plus, I’m behind on my OHD listings–I don’t know how you find the time! Take care. My husband worked for Bob for many years helping with the work on the house. Debbi’s passing was very sad. Her son and my son have been friends since they were 2 years old and lived across the street from us. 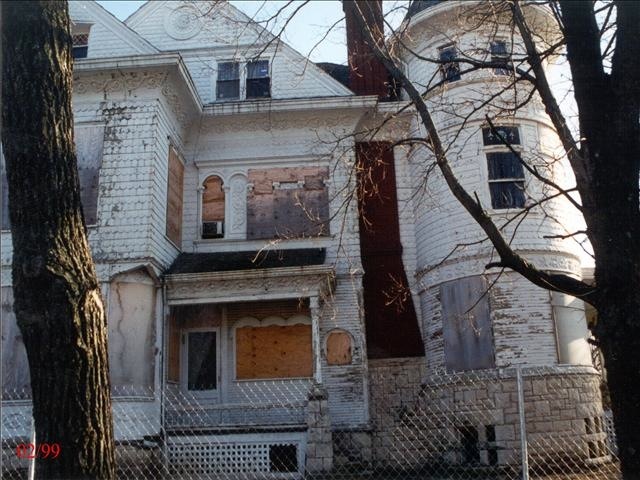 I am glad you have taken on the project of restoring this beautiful home. Bob and I had a nice conversation this week! He has a permanent VIP pass to the Cross House! 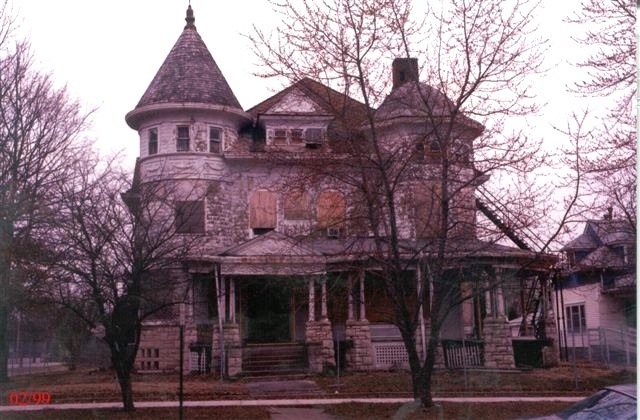 Many years ago, when I went to Texas for my dad’s funeral, I finally got to see his grandfather’s grand old Victorian that he had told me about, and met the lovely couple who had purchased it and were planning to turn it into a bed-and-breakfast. They gave us an amazing tour of the home, and then asked us to stay to lunch and tea, during which we exchanged what we each knew about the history of the home and the family. Unfortunately the husband passed away, and the wife moved into a nursing home, so the house was sold again. This occurred just after my divorce became final, and my former spouse agreed to help me with the down payment on a home, so imagine my frustration when I discovered that I was just too late, and before I had a chance to make an offer, it had a pending contract. Drat, drat and double drat. On the other hand, I never particularly wanted to live in Texas, so there’s that. I now live in Middle Tennessee, just south of Sparta, and there are so many beautiful Victorians, large and small, many of which are vacant. One of the grandest (and my personal favorite) just sold in 2015 for around $100,000, so they are very reasonably priced . . . to acquire. Restoration is something else again entirely, as you well know. Bless you for purchasing this grand old lady, and for your love and care in bringing her back from the brink. I wish you all the best in your endeavors. Wow, what commitment and love Bob and Debbi had as well! !